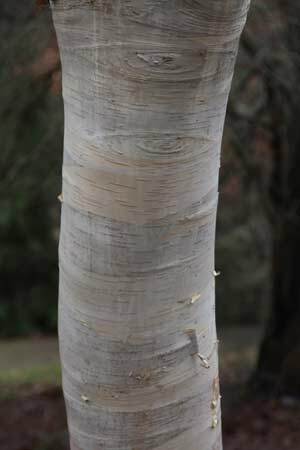 If you are looking for a silver birch with really white bark then Betula jacquemontii is probably the one you are after. The full name is Betula utilis var jacquemontii and this is a smaller growing tree to around 8 – 10m in height in cultivation, taller in ideal conditions. It is fairly upright in habit and it does have attractive green foliage that turns to yellow in autumn. However it is the ghostlike white peeling bark that is so appealing to gardeners around the world. Originally from the foothills of the Himalayas the peeling bark was used by monks as paper. The cultivars such as ‘Grayswood Ghost’ do not seem to be available readily, however the species itself is wonderful. The outstanding white trunk of Betula jacquemontii is pictured right. As long as the soil is moist but well drained Betula utilis var. jacquemontii is happy, in clay soils it will tend to struggle. An open sunny position is best for good growth, however in Australia protection from the hot afternoon sun is best. Excellent as a feature tree where mature specimens are magnificent. Also useful for planting in small groups where the wonderful bark is accentuated. Usually growing with a straight trunk, Betula utilis var jacquemontii is suited to planting as a stand alone feature tree or in avenues where the outstanding bark colour on the trunks creates a strong visual effect. Height – To around 10 metres in height. Spread – will form a crown of 5 – 6 metres over time. Soil – Humus rich, well drained and moist, however very tolerant once established. Folaige – Deep green turning to a golden yellow in autumn. Flowers – Insignificant small catkins.